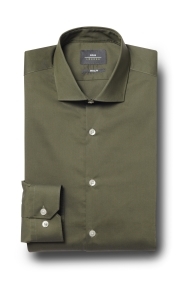 A bold shirt that’s also versatile. 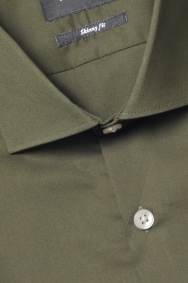 Khaki is a colour that goes with anything, which means this shirt will look just as good with a black suit as it will with a neutral, camel or grey one. It’s designed to bring richness and depth to your smart wear with its deep colour. A skinny fit ensures a sharp appearance at all times and stretch in the material helps it resist creasing while giving you plenty of movement. Try this shirt with a light grey 3-piece and button it all the way to the top for an occasion-ready outfit. A light pink pocket square will add an extra style dimension. Love the colour and is a nice fit ???? I ended up swapping this item for another one.